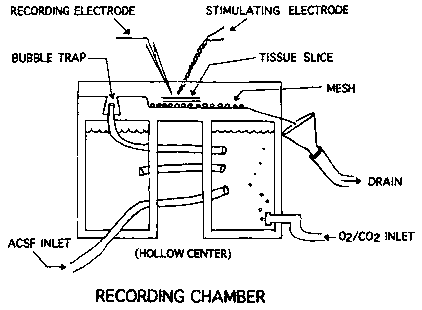 Cross-sectional view of a Haas-type recording chamber used for brain hippocampal slice studies. 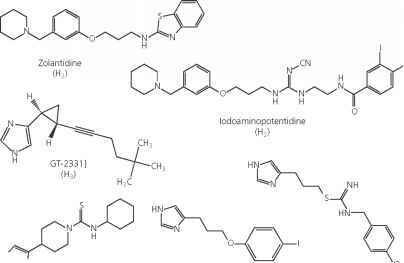 Na K Mg Ca Cl HCO3 Glu Ref. small rodents (38 to 39°C). Our laboratory transfers the slices to the chamber at room temperature and permits them to equilibrate with the new environment for 20 min prior to slowly warming them. Many of our studies have been done at 35°C for the duration of the experiment. This is the temperature suggested by Conners and Gutnick11 to avoid possible metabolic problems in the slice, such as deficits of either oxygen or glucose, essential nutrients for brain tissue. Slice temperature is an important variable and the use of a reliable thermocouple and heater such as the temperature controller available from Medical Systems Corp., Greenvale, NY (Temperature Controller, Model TC-102) has proven reliable and easy to maintain.